Mark Plowman, the son of a brickworks owner, was born on 1st September 1883 at Northumberland Park, Tottenham. His parents were members of the Plymouth Brethren sect. Educated at Paradise House School he left at the age of sixteen to go into his father's business. In 1909 Plowman left the security of the family business in order to become a writer. He also abandoned his religious faith and declared that he was a socialist. Plowman married Dorothy Lloyd Sulman on 1st May 1914. On the outbreak of the First World War he joined the British Army. Initially he was an orderly with the 4th field ambulance at its Essex headquarters but decided to transfer to a fighting regiment. He explained his decision in a letter to Hugh de Selincourt: "Who am I that I should say to another man - You do my killing? … One either believes in active resistance or non resistance. If I lived in an ideal world I should believe in non resistance & to make that dream reality I shall always throw in my tiny weight. That's my direction." Plowman joined the 10th Yorkshire Regiment and by the summer of 1916 was serving on the Western Front. Within a few months of being on the front-line he was having severe doubts about the morality of war. In October 1916 he wrote: "I want to exploit the fear of war… I want to start an International League of individuals sworn never to take up arms … And so I'm here in mud & blood & all the damned insanity of war & I wouldn't be out of it, things being as they are." In January 1917 Plowman was concussed by a shell-burst and invalided home. He was treated by Professor William Rivers at Craiglockhart War Hospital near Edinburgh. Like the writer Siegfried Sassoon, he became a pacifist while suffering from shellshock. He wrote: "the Army has had all the useful service it will ever get out of me… I'm too tired of it - too entirely soul sick of it." During this period, before he was transferred to the reserves, he wrote his pamphlet The Right to Live, On 14 January 1918 he submitted the resignation of his commission on grounds of conscience. He argued that his hatred of war "has gradually deepened into the fixed conviction that organised warfare of any kind is always organised murder." He added: "So wholly do I believe in the doctrine of Incarnation (that God indeed lives in every human body) that I believe that killing men is always killing God." As Martin Ceadel, the author of Pacifism in Britain 1914-1945 (1980) pointed out: "He was fortunate not only to escape with a simple dismissal from the army, but also, because of delays in the conscription procedure (to which he was now liable as a discharged volunteer), to avoid prison as an absolutist." In 1919 he explained his actions in War and the Creative Impulse which according to Caedel "defined the classic socialist pacifism which he unwaveringly asserted for the rest of his life." In this respect he shared the views of Clifford Allen and Fenner Brockway. 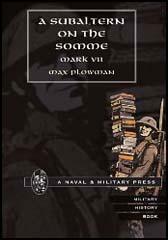 Max Plowman became active in the pacifist movement and in 1927 he published an account of his experiences on the Western Front entitled A Subaltern on the Somme. He was also an expert on the works of William Blake and later that year published An Introduction to the Study of Blake. In 1929 Plowman met John Middleton Murry, who introduced him to Richard Rees, the editor of The Adelphi. The three men were all socialist pacifists. According to Richard A. Storey: "Plowman first met the writer and critic John Middleton Murry early in 1929 and the remaining years of his life were marked by a growing friendship and debate with Murry and an active, though still highly critical, involvement in pacifist affairs as the world situation deteriorated." On 16th October 1934, Richard Sheppard, a canon of St. Paul's Cathedral, had a letter published in the Manchester Guardian inviting people to send him a postcard giving their undertaking to "renounce war and never again to support another." Within two days 2,500 men responded and over the next few weeks around 30,000 pledged their support for Sheppard's campaign. The following year Sheppard formed the Peace Pledge Union. Plowman became a strong supporter of the PPU. Other members included George Lansbury, Vera Brittain, Arthur Ponsonby, Wilfred Wellock, Maude Royden, John Middleton Murry, Siegfried Sassoon, Donald Soper, Aldous Huxley, Laurence Housman and Bertrand Russell. When Sheppard died in 1937 Plowman became the new general secretary of the PPU. In 1934 John Middleton Murry purchased a farm in Langham, Essex. Murry and Plowman established a pacifist community centre they called Adelphi Centre on the land. Murry argued he was attempting to create "a community for the study and practice of the new socialism". Plowman organised summer schools where people such as George Orwell, John Strachey, Jack Common, Herbert Read and Reinhold Niebuhr lectured on politics, philosophy and literature. During the Spanish Civil War the farm was handed over to the Peace Pledge Union. They used it to house some 60 Basque refugee children. Plowman continued to work for The Adelphi. When Richard Rees resigned as editor John Middleton Murry resumed editorship until 1938, when Plowman took on the role. Richard A. Storey has argued: "Although he lacked the benefit of a university education, Plowman's passionate commitment to literature, which achieved scholarly status in his work on Blake and with which his pacifist philosophy was closely connected, provided both his raison d'être and the livelihood for himself and his family." During this period he became a close friend of George Orwell who reviewed books for the journal. On the outbreak of the Second World War the Adelphi Centre became home for some twenty elderly evacuees from from Bermondsey, Bow and Bethnal Green. It was also a co-operative farm of 70 acres with a group of young conscientious objectors. Mark Plowman died on 3rd June, 1941 and is buried in Langham churchyard. I want to exploit the fear of war… I want to start an International League of individuals sworn never to take up arms… And so I'm here in mud & blood & all the damned insanity of war & I wouldn't be out of it, things being as they are. Although the circumstances of Max Plowman's protest were remarkably similar - like Sassoon he was a wounded poet who was briefly treated by Professor Rivers and who ultimately escaped military punishment - his objection to war was, in contrast, based on a profound and unshakeable pacifism. Even before the war Plowman had taken risks for his convictions, leaving his father's brick factory to eke out a precarious living as a writer. And, as a socialist, he had always had doubts about the war: he did not volunteer until December 1914, and then only for ambulance work. The first sign that his views on war were being clarified' was his decision in July 1915 that there was no difference in principle between combatant and non-combatant service. At first he decided to fight and was commissioned into an infantry regiment, reaching the front in August 1916. In January 1917, however, he was concussed and invalided home, never to return to the trenches. It was during his sick leave that he gradually discovered he was a pacifist; and it was under the influence of Tagore's Nationalism that, in January 1918, after a year away from the front, he took the step of resigning his commission on the ground that his hatred of war "has gradually deepened into the fixed conviction that organised warfare of any kind is always organised murder." Although similar in most respects to the Christian socialism of, for example, Wilfred Wellock, it was clearly "political" in that it was inspired not by any appeal to supernatural authority but by a mystical, almost anarchist, conception of socialism which Plowman had long admired in his literary hero, William Blake.